Skiing – advantage for all family. For adults it is a good way постройнеть, to strengthen nervous system and to raise a vitality. And for children of a ski become both entertainment, and the useful physical culture disciplining and strengthening health. Both that and others by means of skis will be able to strengthen and develop a backbone as this sport involves the majority of muscles of backs. If you have no skis – it doesn’t matter! You can use our point of hire. Start having a rest actively, will feel to itself more fine and more cheerfully! Take with itself children, relatives or friends, such rest will bring not only benefit, but also pleasure of communication with dear people. The advantage of skiing is invaluable! One of the best types of active recreation in the winter — ski drivings. 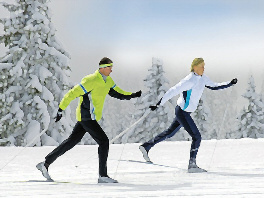 It is difficult to challenge advantage of such walks, after all during a driving all bodies and muscles strenuously work at skis that well influences all organism. It any more without telling about stay in the fresh air, among the salutary nature.